Herschelle is sure he’s prepared for his new life in Australia. After all, he studied Aussie slang on the internet before he left South Africa, so he knows he’ll be able to communicate. Unfortunately, things don’t go as well as Herschelle would like. No-one understands his Aussie chat or his South African accent. He isn’t used to being laughed at for being different or being the victim of bullying and he certainly isn’t used to being the victim of racism. Herschelle thought they had left issues like that behind in South Africa. Will anyone take the time to get to know Herschelle well enough to become friends? 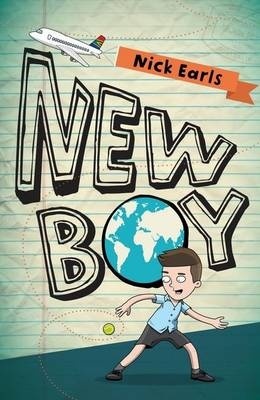 New Boy offers an interesting and thoughtful twist on the familiar themes of new kid in school and clash of cultures. To outward appearances, Herschelle is just like the kids at his new Australian school, but his name, accent, vocabulary and experiences make it difficult for him to find his place in his new environment. Author Nick Earls shares Herschelle’s story with a large helping of humour and the reassuring familiarity of family life and school routines, however he also delivers some thought-provoking ideas on fitting in and accepting others. Earls doesn’t shy away from using words like ‘bullying’ and ‘racism’ to ensure that young readers understand that the challenges faced by Herschelle are serious, despite the often light-hearted tone of the novel. This older junior fiction novel delivers an engaging, interesting story that should get readers thinking about the topics of diversity, racism and bullying. I particularly appreciated the way the racial history of South Africa was introduced through the story and think that the fact that Herscehelle wasn’t visibly different but could still be the victim of racism was an interesting point to raise. New Boy is perfect for starting classroom conversations on these topics or simply to broaden the cultural awareness of junior and middle fiction readers.